The Shocks are also sending a contingent of 17 men to the Texas Relays. The Longhorn Network will broadcast the meet (some on a tape delayed basis). Featured events include, Aaron True in the "Section A" of the men's javelin on Friday, March 29 at 6:00 p.m. He enters a field that includes 2018 national champion Anderson Peters of Mississippi State. True enters with the No. 9 ranking in the nation. Rayvon Allen and Jared Belardo enter a talented "Section A" long jump field that features No. 2 in the nation Jordan Latimer of Akron and No. 17 Justin Hall of Texas Tech. Allen enters the competition ranked No. 9 in the nation, while Belardo sits at No. 37. Multiple Shocker sprinters will get their first look at conference foe Houston. Allen and Austin Corley will enter the 400m hurdles that features Cougars Amere Lattin and Jordan Quivell. Lattin is currently the national leader with a time of 49.82, followed by Quivell at No. 2 with a time of 50.87. In addition, the Shocks are also sending a contingent of 25 men to the Bobcat Invitational hosted by Texas State University in San Marcos, 30 miles south of Austin. 2018 American Athletic Conference champion Austin Corley advanced to Friday's 400m hurdles final with a qualifying time of 51.43, he finished second in the third heat. His time was the sixth fastest qualifying time of nearly 80 athletes, the top nine times advanced. Houston So. Quivell Jordan qualified 2nd at 51.05 but Houston Sr. Amere Lattin false started. Jed Helker made his 1500m Shocker debut competing in section A, the true freshman finished seventh with a time of 3:57.70. Pretty good time for a true freshman. That time would have won the AAC Championship last year but times in these tactical races are hard to compare and the race in the AAC Championship was run at a pretty slow pace. Nathan Wickoren clocked in at 9:25.08 in the men's 3000m steeplechase to finish eighth, while Hayden Bugner placed sixth in pole vault, competing in pit 2, he cleared 5.05m/16-6.75. Decent time for Nathan this early in the season but he has run as fast as 9:11.61 in he past. Pretty good vault by Hayden. His PR is 16-10.75 set in last year's AAC Championship. Following a preliminary qualifying sixth place finish on Thursday, Austin Corley was in action for the second consecutive day. Corley finished ninth in the men's 400m hurdles with a time of 53.62. Not a particularly good time for Austin and well of his time in the prelims. Not sure if he might have hit a hurdle or otherwise misstepped to thrown him a bit off stride or perhaps something physical or just one of those days. Joseph Holthusen won the first section of the men's 110m hurdles with a collegiate personal best time of 14.54. The true freshman finished 31st in a field that 75 athletes in 10 heats. That's a pretty good time for the somewhat undersized freshman in only his 2nd 110m hurdle race of his career. Denvoir Griffin finished sixth in the sixth heat of the men's 100m dash with a time of 10.95. Okay, but not good enough to score in the AAC. Shocker men had three relays on the track, including distance medley relay, 4x400m relay and 4x100m relay. The distance medley relay team of Jed Helker, Adam Gauzy, Connor Stine and Ben Flowers finished 10th with a time of 10:13.67. 4x400m team of Corley, Gauzy, Kaden Griffin and Rayvon Allen placed 13th (3:14.44), while the 4x100m team of Denvoir Griffin, Allen, Richard Sandefur and Jared Belardo ran 42.54 to finish 30th overall. Nothing particularly special here. Belardo finished fourth in section B of the men's triple jump with a mark of 15.21m/49-11. Good solid jump by Jared but he has a little more in him. Cory Martens placed 11th in section B of the men's discus with a throw of 51.24m/168-1. Decent throw Cory. A few feet shy of his PR. Rayvon Allen highlighted the day for the Shockers in Austin, he finished 10th in section A of the men's long jump. On his first attempt, the St. Louis, Mo., native recorded a personal best mark of 7.75m/25-5.25. His second attempt landed at 7.64m/25-0.75 and third attempt at 7.61m/24-11.75. The sophomore's best jump of 7.75m/25-5.25 passes Ralston Varlack (7.74m/25-4.75, 1998) for 7th place on the Shocker all-time top-10 list. Ethan Kossover highlighted the day for the Shockers winning the 3000m steeplechase with a personal best time of 9:18.44, he shaved nearly 18 seconds off his previous best. Teammate Cory Landon followed in third place finishing the race in 9:30.47. Solid time for the 2 sophomores. Excellent improvement by Ethan. Cory has run 9:23.11. Will need times close to those PR's to perhaps edge into the scoring in the AAC Championships. Joseph Holthusen competed in the men's 110m hurdles, he won section four and finished sixth overall clocking in a collegiate personal best time of 14.47. Pretty solid time for the somewhat undersized freshman out of Bishop Carroll. Probably good enough to score a few points in the AAC. Zack Penrod finished fourth in section three of the men's 1500m with time of 3:47.80. Good early season run for Zack, just a couple of seconds off his PR. Best time in the AAC so far this season but it is very early. Sr. Ben Johnson won the decathlon with a score 6,567 points despite fouling on all 3 of his attempts in the discuss and scoring no points in that event and with a somewhat sub-par javelin throw. He did set a new PR in the 100m dash at 10.85 although wind aided. He tied his PR in the pole vault. Ben would have easily surpassed 7,000 points with a normal result from the discus and the javelin. So. Jake Horsch, the Shockers 2nd best decathlete did not compete this weekend. Not sure if he is dealing with an injury or not. Fr. Jed Helker battled to take gold in the 1500m race with a personal best time of 3:50.62, the true freshman shaved seven seconds from his previous best time. That's the 5th best time in the ACC so far this year. Meanwhile, in Fayetteville, Ark., Zack Penrod won the John McDonnell Invitational 1500m race with a personal best time of 3:44.72. Penrod improved his No. 5 Shocker all-time top-10 mark in the event and the best time in the AAC this year. All-American Aaron True took control of the javelin field winning the event with a throw of 72.45m/237-8, he led the competition after his first attempt and never lost the lead. Teammates Jeff Ast and Cauy Lindsay each recorded top-5 finishes in the throwing competition. Ast placed second with a mark of 61.29m/201-1, while Lindsey threw a personal best 57.14m/187-5 to finish fourth. Aaron's throw is easily the best throw in the AAC this year and Jeff's throw is 3rd best in the AAC this year. I don't know what the status of So. Taran Taylor is whose best throw last year was 243-8. Taran has not thrown in a meet so far this year. So. Ben Flowers finished second overall with a personal best in 14:37.82 which is 8th best at this point in the AAC this year. Sr. Pedro Montoya led the group placing second running a personal best time of 30:42.13 which is 2nd best in the AAC so far this year. True Freshman Joseph Holthusen won the men's 110m hurdles clocking in at 14.52. Only about 0.05 seconds off his PR which is 5th best in the AAC this year. R-Jr. Austin Corley won the men's 400m hurdles in 51.97. That's about 0.5 seconds of his season best which is currently 3rd in the AAC and well off his PR of 50.07 he ran in winning the AAC Championship last year. Not sure Austin has another one of those efforts in him but he never the less a strong 400 hurdler. Cory Martens, a graduate transfer from Chadron State, won the discus with a throw of 51.41m/168-8, was 2nd in the shot put with a toss of 16.79m/55-1 despite fouling on his final 5 attempts and was 3rd in the hammer throw at 58.61m/192-3. Cory should be in the hunt for points in all 3 these events come AAC Championship time. Shocker Junior Michael Bryan who is redshirting this year took 2nd in the hammer throw at 59.16m/194-1. Jordan Huckaby, a 2016 Texas State graduate, won the the hammer throw. Sr. Hayden Bugner won the pole vault with a clearance of 4.96m/16-3.25 which in these windy conditions is quite good. Hayden probably can't win the AAC pole vault championship but he has a good shot at a top 3 finish. R-Jr. Mason Buckmaster won the high jump equaling his personal best height of 2.09m/6-10.25 which is a very good jump in today's conditions and would score well in the AAC Championship if he can duplicate it. Senior javelin thrower Aaron True was named the American Athletic Conference Male Field Athlete of the Week for the week of April 9-16, the league announced Tuesday. For the second time in four weeks Aaron True has garnered Male Field Athlete of the Week honors, he first was honored for his performance at the Herm Wilson Invitational during the week of March 19-26. All-American True dominated the K.T. Woodman Classic javelin field on April 12, winning the competition with a meet record throw of 72.45m/237-8. The Leroy, Kan., native recorded throws of 69.00m/226-4, 69.31m/227-4, 70.22m/230-4 and his competition best of 72.45m/237-8. He improved his conference leading mark by nearly seven feet, since opening the season on March 23 he has led The American with the top javelin throw. He also improved his national ranking moving up seven spots to No. 5 overall and No. 3 in the NCAA West Regional. Very nice article by Taylor Eldridge on Shocker freshman hurdler Joseph Holthusen out of Bishop Carroll High School. 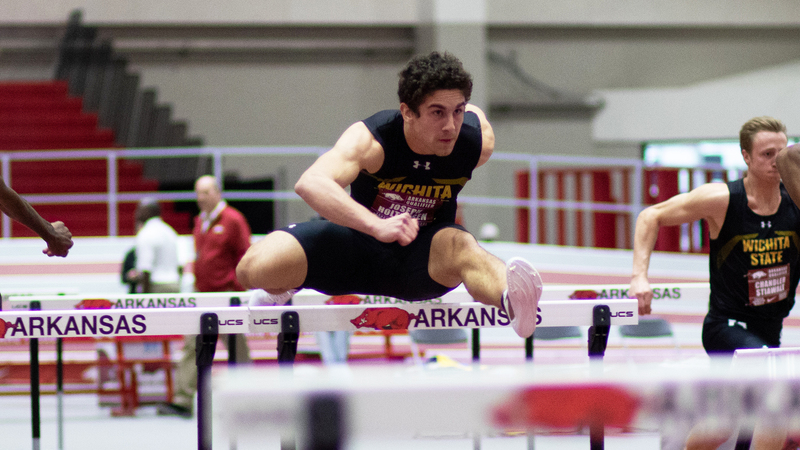 I have commented on numerous times during the past Indoor season and the current outdoor season about Joseph's impressive start to his Shocker career especially for a somewhat undersized hurdler. Hopefully, his improvement continues throughout his career. Sounds like one of Joseph's best traits is his competitiveness. Even when Holthusen arrived to WSU and went through Rainbolt’s preseason tests, he graded out in the middle of the pack. That typically does not signify a breakout season is coming. But something happened every time Holthusen lined up for a race: he got faster. I'll take all the gamers we can get our hands on. Last edited by 1972Shocker; 6 days ago. Aaron True started things off hot for the Shockers in dominating fashion, the All-American won the javelin with a season best throw of 75.33m/247-1. His mark currently ranks No. 3 in the nation and he improved his No. 1 ranking in AAC where he is about 45.5 ft. ahead of the next best throw of the season. Today's throw was about 7 feet short of his Wichita State school record. Freshman Cauy Lindsay set at PR in the javelin at 189-4 which is 9th best in the AAC this year. Austin Corley won the 400m hurdles with a season best time of 50.90 which is the 3rd fastest in the AAC this year behind 2 Houston speedsters. Austin has won the 400m hurdles in three of four meets this season. The Shocker men's 4x400m team held off a late surge from Kansas to finish on a high note winning the race in 3:10.51. The group of Corley, Jace Coppoc, Adam Gauzy and Rayvon Allen recorded a Shocker season leading time and currently ranks No. 2 in the AAC. This time is about a quarter of a second short of Shocker all-time top 5 ranking. Rayvon Allen, of course, is primarily a long jumper and a triple jumper. Hayden Bugner in pole vault (5.10m/16-8.75) which is 2nd best in the AAC this year. True freshman Joseph Holthusen ran the 110m hurdles finals in a wind aided 14.36, a new PR and 5th best in the AAC. Zack Penrod in the 800m with a time of 1:52.12 about 1.5 seconds off his PR but 6th best in the AAC this year. Yes, it's True. The men's javelin competition will be one of the must see events for me at the upcoming AAC Outdoor Championships at Cessna Stadium in 2.5 weeks. I am thinking the javelin will be held inside the stadium since that is what they did at the Herm Wilson Invitational last month. Last edited by 1972Shocker; 12 hours ago. For the second week in a row and 3rd time in 5 weeks, senior Aaron True was named the American Athletic Conference Male Field Athlete of the Week, the league announced Tuesday. True won the 92nd Kansas Relays javelin with a season best throw of 75.33m/247-2, his third event title of the 2019 outdoor season. The Leroy, Kan., native is currently ranked No. 1 in NCAA West Region and No. 3 in the nation. True has also been ranked No. 1 in the American Athletic Conference since opening the season on March 22, at the Herm Wilson Invitational. Aaron's career PR and he Wichita State record is 77.49m (254-3). I don't know if he has an 80m (262-6) throw in him or not but would love to see that at some point this season. Preferably in the NCAA's. True will compete at the Red Raider Shootout on Friday, April 26, in Lubbock, Texas. 1972Shocker, it depends on which way the wind is blowing. If it's from the south (which is the most common) they will throw inside the stadium. If it's from the north they will throw outside the stadium.